Heavy equipment used for the snow removal effort made its way down North Winooski Street in Burlington Wednesday morning. A plow driver used a broom to clear off his truck in Burlington. Officials advised Vermonters not to travel unless necessary Tuesday, citing poor road conditions. Drivers from Burlington cross the bridge over the Winooski River Tuesday afternoon. 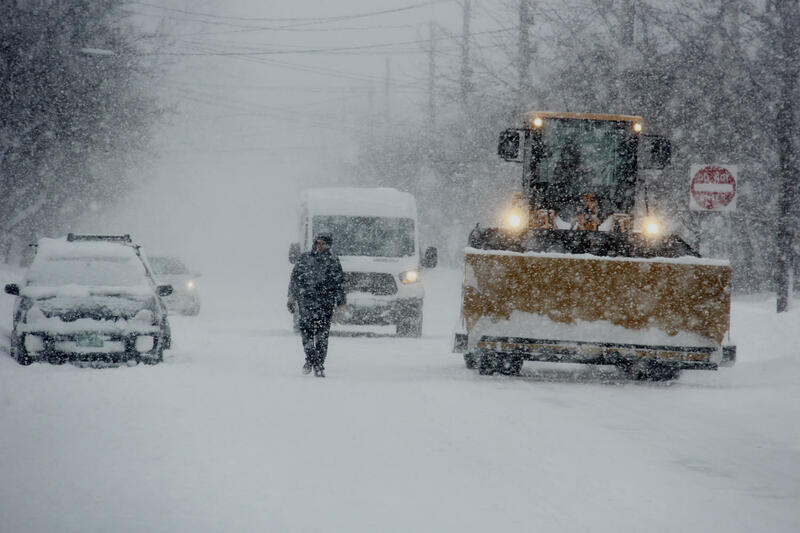 The National Weather Service's Burlington office says the storm that hit Tuesday through Wednesday is the second-biggest snowstorm to hit the state, with snowfall totals just shy of 30 inches reported in Burlington. The NWS's Burlington office tweeted that, as of 3:50 p.m. Wednesday, 29.9 inches had fallen at Burlington International Airport. This puts this week's storm in second place for record snowfall in Vermont, behind a January 2010 storm that dumped 33.1 inches on the state. Final Update 3/15/2017 6:05 p.m.
A winter weather advisory is in effect for eastern Chittenden and Franklin, Bennington, Lamoille, Orleans and Western Windham Counties till Thursday morning. The rest of the state is now free of advisories and warnings. Wednesday morning the NWS canceled a blizzard warning that was issued Tuesday for the western edge of Vermont. The University of Vermont has delayed reopening until noon Thursday, March 16. The Chittenden Solid Waste District (CSWD) has announced that all facilities are closed for the day. Montpelier has canceled a parking ban planned for Thursday morning. The National Weather Service's Burlington office Twitter account says 28.7 inches of snow has fallen so far at Burlington International Airport. The Chittenden Solid Waste District has extended their delay due to road conditions and will open at noon. Check the CSWD website for updates. The parking ban in Burlington has been extended to Wednesday evening, and will start at 10 p.m. Vehicles on residential streets between 10 p.m. Wednesday and 7 a.m. Thursday will be ticketed and possibly towed. Click here for the latest. Green Mountain Transit has delayed the start of bus service until 7 a.m. to allow road crews time to clear the roads. Check their website for updates before heading out. Burlington City offices will reopen at 8:45 a.m. Snow buildup and low visibility made for a difficult Wednesday morning commute as cars shared the road with pedestrians and heavy equipment. Champlain College's Burlington campus will be closed Wednesday. A number of K-12 schools have said they will be closed Wednesday or will be opening after a two-hour delay. Check the full list of school closings for details. The Burlington Police Department advised people "avoid any driving in Burlington, especially the beltline." Slippery road conditions made the beltline stretch of Route 127 challenging for drivers Tuesday afternoon. The Vermont State Police said driving conditions on I-89 and I-91 are "extremely difficult" and advised drivers to stay off the roadways. If you must drive, police said, "prepare for blizzard conditions and drive appropriately." Parking bans were announced in Burlington, Winooski, Colchester and Montpelier for Tuesday night. The Colchester Police Department asked drivers to "refrain from any unnecessary driving on all roads until further notice." Flights in and out of Burlington Airport have been canceled, so be sure to check your flight status before leaving for the airport. Burlington Mayor Miro Weinberger announced that City offices will close at 1 p.m. Tuesday. A decision will be made by 6 a.m. as to if the City will reopen Wednesday, officials said. Gov. Phil Scott released a statement advising the public "to avoid unnecessary travel" due to heavy snowfall that could drastically limit visibility. State offices are now closed and a decision on if they will open Wednesday will come Tuesday night. Green Mountain Transit has made changes to their schedule limiting afternoon and evening travel. The latest details on closings and delays can be found below. 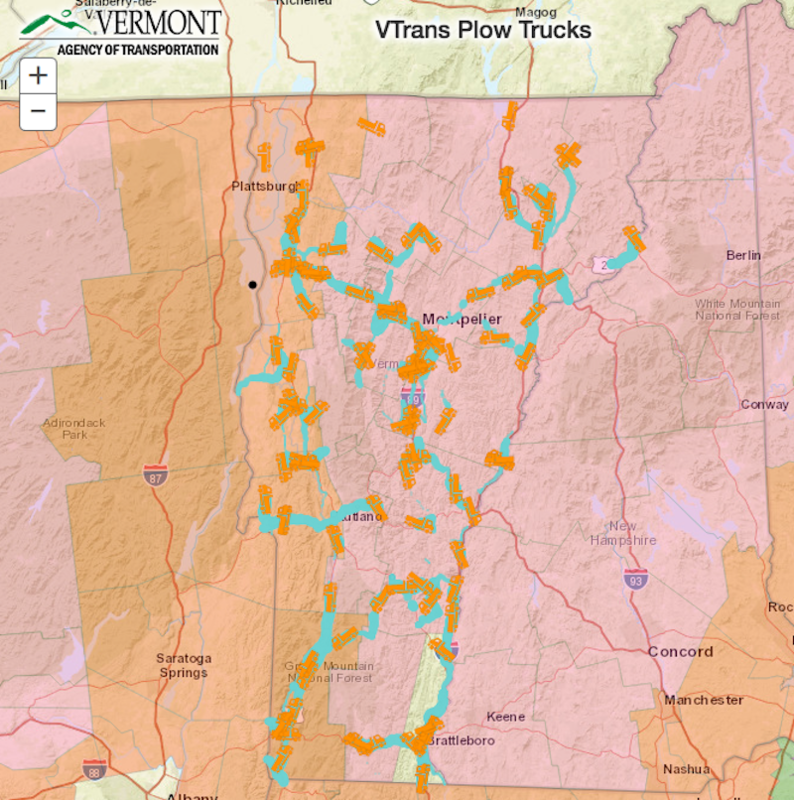 The Vermont Agency of Transportation's Plow Finder as of 10:30 a.m. Tuesday morning. The eastern part of the state (pink) is under a winter storm warning, while in the western part of the state a blizzard warning is in effect. Green Mountain Power will provide updates on Facebook, Twitter and to the media. Customers may report outages and get updates through GMP's text service or app, as well as calling 1-888-835-4672, or visiting GMP's Outage Center page. The following are events, planned for Tuesday and Wednesday across the state, have been canceled or rescheduled due to the storm. Check here for school closings. This list is incomplete, and will be updated throughout the day Tuesday. If you know of an event being affected by the storm please email share@vpr.net, tweet @vprnet or leave a comment at the bottom of this post. Amtrak: Vermonter trains are canceled. Service is scheduled to resume out of St. Albans Thursday morning. Burlington: City offices opened at 8:45 a.m.
Champlain College: The Burlington campus and all administrative offices are closed. Chittenden Solid Waste District: All facilities closed Wednesday. Check the CSWD website for updates. Colchester: A winter parking ban is in effect until 6 a.m. Friday, March 17, which includes all public roads and parking lots. Green Mountain Transit: Service was delayed until 7 a.m. Check here for details before traveling. 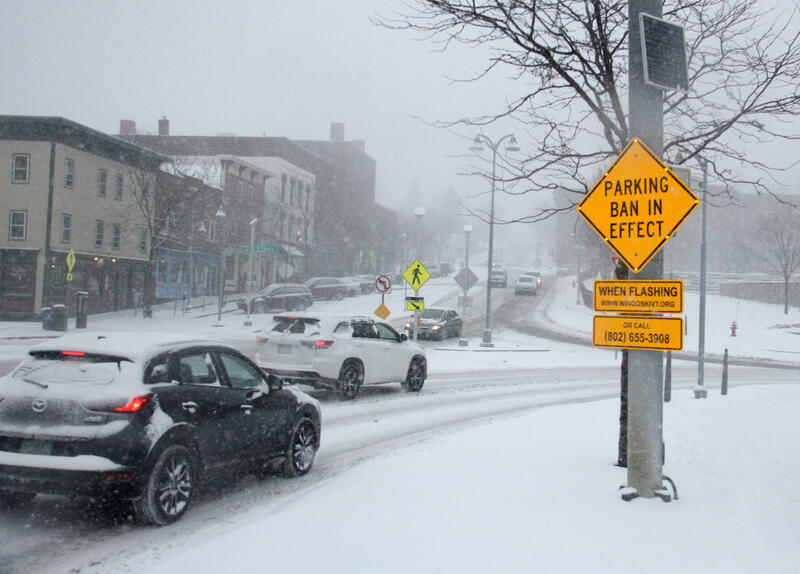 Montpelier: A parking ban will be enforced starting at 1 a.m. on city streets. The parking ban for Thursday morning starting at 1 a.m. has been canceled. University of Vermont: The school and all administrative offices are closed and events are canceled. The school will reopen Thursday, March 16 at noon. Vermont Fish And Wildlife Board: Waterfowl hearing in Essex rescheduled for Wednesday, March 22 at 6:30 p.m. The cities of Winooski, Burlington and Montpelier all announced parking bans for Tuesday night. Amtrak: Vermonter trains are canceled. Service will resume out of St. Albans Thursday morning. Brownell Library: Closes at noon on Tuesday. Burlington: City offices will close at 1 p.m. and the Mayor's office says a decision will be made by 6 a.m. if they will reopen Wednesday. A parking ban is in effect for Tuesday night until early Wednesday morning. Burlington Airport: Many flights in and out of BTV have been canceled. Check with your airline or the airport's website for the latest. Castleton Free Library: Closed Tuesday. Central Vermont Medical Center: ExpressCare locations in Berlin and Waterbury will close at 4 p.m. Call (802) 371-4239 to check status. Chittenden Solid Waste District: All facilities will be closed Tuesday. Greyhound: Connecting routes out of major cities in the Northeast have been canceled. Click here for more details. Green Mountain Transit: Local routes and commuter routes in Chittenden County, the Capital District and Franklin and Grand Island County routes have been affected by the storm. Check here for details before traveling. Lebanon, N.H.: Commercial flights out of Lebanon Municipal Airport are canceled. Middlebury Select Board: Tuesday night meeting rescheduled for Tuesday, March 21 at 7 p.m.
Middlebury: The property tax deadline has been extended to Thursday, March 16 at 5 p.m.
New England Federal Credit Union: All offices will close at 3 p.m. unless regular closing time is earlier. Rutland-Southern Vermont Regional Airport: Commercial flights canceled. University of Vermont: Closes at noon Tuesday. All administrative offices are closed and events are canceled. The school will reopen Thursday, March 16 at 6 a.m.
Vermont Agency of Commerce and Community Development: Northern Border Regional Commission information session schedule for Tuesday morning has been rescheduled for Thursday, March 16 from 9-11:30 in Swanton. Vermont State Courts: All state courts and court offices will close Tuesday at 10:30 a.m.
Vermont State Employee Credit Union: Closes at noon Tuesday and will open at 10 a.m. Wednesday. Vermont State Offices: State offices are now closed and officials say they'll reach a decision Tuesday night about whether offices will reopen Wednesday. Vermont Translines: Service on both routes is canceled Tuesday. Williston: Town offices will close at 1 p.m.
Winooski: A parking ban is in effect starting at 4 p.m. Tuesday. Officials have not announced when the ban will be lifted.